The farm was started in 1960 by Arthur and Josephine Pearse growing vegetables in the heart of the village. Their daughter Ellen, and her husband Adam have taken on the work of managing the 600 acres of mostly National Trust owned land, growing cereals and raising cattle and sheep. 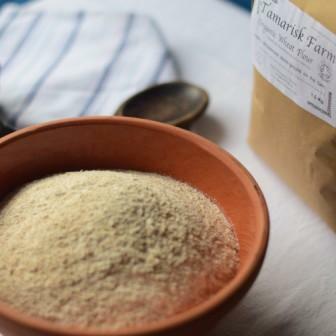 Tamarisk Farm was fundamentally organic even before Organic certification existed. Our horses are the offspring of shire horses that were used as draught animals at that time. Nowadays they help us get around the farm and herd the animals. The current farm is, we believe, the best of both worlds: a mixture of time tested, and modern approaches to putting quality food on the table. We strongly believe in the necessity of sustainable agriculture. In concert with the National Trust we manage our pastures in wildlife friendly ways, providing valuable scrubland and wetland habitats by careful grazing of our animals. This is not only great for the fertility of the land, but also for the rich flavour of the meat from our grass-finished and slow matured livestock.